The establishment of this Order, after much discussion and opposition, arising from a feeling that it was contrary to freedom and equality, the watchword of the Revolution, was at last carried (1802) in the Legislative Body by a majority of one hundred and sixty-six to one hundred and ten. The Legion of Honour was meant to be an institution, at once the safeguard and protection of all republican principles and regulations, of all the laws of equality, and for the abolition of all the differences of rank in society as created directly or indirectly by the nobility. The Order was originally divided into three classes: - Legionaries, Grand Officers, and Commanders. After the coronation of Napoleon (14th July,, 1804), the first class of Grand Officers was divided into Knights of the Grand Eagle, (as the highest,) and Grand Officers. In 1810, the first class already exceeded by nineteen thousand the limits fixed by law; while in 1814, the Legion counted about thirty-seven thousand members. This vast number naturally deteriorated much from the value of the decoration. The Restoration, though it retained the Imperial Order of the Legion, by no means resigned the legacy of the old monarchy with regard to orders. The Order of the Holy Ghost was the first rescued from oblivion. The Legion was converted into an Order, and lost its original character and signification. The number of the educational establishments, in connection with the Order, was greatly reduced, the effigy of Napoleon was exchanged for that of Henry IV. ; while the Eagle - despite its five wings - was christened "Cross". The Knights of the Grand Eagle became Knights of the Grand Ribbon (Grands Cordons), and the Legionaries, became Knights. Moreover, all the nominations which had taken place during the Hundred Days, were nullified by Louis XVIII. on his return to Paris, after the battle of Waterloo. In 1816, the pay of the members was reduced to half, and compensation was only granted in 1820. During the Restoration, sixty-three ribbons of the Holy Ghost, and twelve thousand one hundred and eighty crosses of St. Louis were distributed, while the members of the Legion increased to forty-two thousand. The present statutes of the Legion provide : - That the Order is to be conferred by the King as President, for important civil or military services rendered to the state. That it is to consist, besides the royal family and foreigners, of eighty Knights of the Grand Cross, one hundred and sixty Grand Officers, four hundred Commanders, two thousand officers, and an unlimited number of Knights. The candidates, in time of peace, must prove that they have served, with the requisite distinction, for twenty years in some military or civil department. In time of war, the Order is also awarded for exploits, or severe wounds received in battle. The first claim to the Order must begin with the lowest degree of Knights, as no degree can be passed over. Promotion requires a standing in the fourth class of four, in the third class of two, in the second class of three, and in the fourth class of five years. There are usually two distributions in the year, on the 1st January, and on St. Philip's day (1st May). The nomination of military persons takes place on parade; and of civil, at the courts of justice, in the presence of the Grand Chancellor or his deputies. No ignoble punishment can be inflicted on a member of the Order, so long as he belongs to it. The decoration consists of a white enamelled star with double rays under a royal crown. 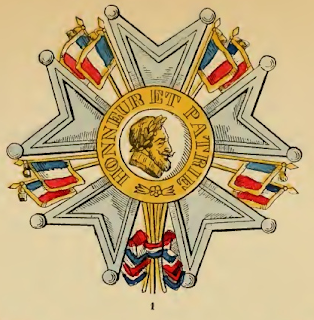 The centre represents on the front the effigy of Henry IV., and on the reverse the motto : "Honneur et Patrie" (Honour and our country), as legend in a golden field with two tri-coloured flags. (No. 2). The star for the Knights is in silver, and for the other classes in gold. The Knights and officers wear it at the button-hole; the Commanders round the neck. The Grand Officers wear besides upon the right breast a star embroidered in silver, similar to that of the Grand Crosses, and at the button-hole, a golden star. The Knights of the Grand Cross wear the same golden star, but somewhat larger, suspended by a ribbon across the right shoulder towards the left hip; and, also, on the left breast of the coat or cloak, a star embroidered in silver (No. 1), the centre of which contains the effigy of Henry IV., with the legend : "Honneur et Patrie". The intervening spaces of the five wings of that star are tilled with golden lances and tri-coloured flags. The college of the Legion possesses in rentes and shares in the canals of Orleans, Loing and the South, a revenue of 7,103,098 francs, of which sum about 5,829,000 francs are annually spent in the pay of the Legionaries, and in pensions (of 250 francs each) to the sub-officers and soldiers. Napoleon I established, at St. Denis and Ecouen, two boarding-schools for six hundred young girls, daughters, sisters, nieces and cousins of the Legionaries, two hundred of whom were educated at the expense of their families, three hundred as half boarders, and one hundred entirely free. Six other establishments for the female orphans of the Legionaries were founded in 1810, while the male orphans were received at the military schools and college. The Restoration only retained the boarding-school of St. Denis, reducing the number to five hundred pupils, four hundred of whom, including the daughters of the members of all Orders in the kingdom, were to enjoy free board and education. The orphan institutions were reduced to two, receiving two hundred pupils free, and being managed by the nuns of the "Congregation of the Blessed Virgin". By the law, 19th April, 1832, the decorated of the Hundred Days were admitted to a pension of 250 francs each. On the 16th June, 1837, a new military class was admitted to the decoration of the "Cross", together with a pension. In 1845, the Legionaries since 1814, as also the Knights who underwent amputation in consequence of wounds, were ordered to receive 100 francs for life in addition to their regular pay, while to the sub-officers and privates who were in active service at that period, and who, by decree, of the 27th February, 1815, were received into the Legion, was granted a sum of 250 francs each. From 1831 to 1841, not less than four thousand one hundred and twelve sub-officers and soldiers received the "Cross", while on the 30th November, 1845, about fifty thousand two hundred and twenty-seven persons were in possession of it. The amount of pension then paid out was 5,975,009 francs. Since then, the annual distribution of the cross has been reduced to two hundred. On the 24th May, 1851, it was decreed that until 1860 only one nomination should take place for every two extinct ones, and that the annual pensions are not to exceed 100,000 francs. 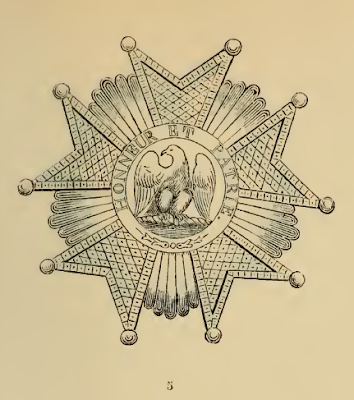 The Imperial Eagle, which was again placed on the army colours, was also restored to the "Cross"; and, by a decree, of the 31st January, 1852, the previous imperial form of decoration was generally re-introduced into the realm (Nos. 5 and 6). The President, Louis Napoleon, decreed, that a part of the property of Louis Philippe, which had been restored to the state, should be set apart as an endowment for the Legion of Honour; he also fixed the pensions of the Legionaries at 250, of Officers at 500, of Commanders at 1000, of Grand Officers at 2000, and of Grand Crosses at 3000 francs each. On the 1st October, 1853, the Order counted sixty-five Grand Crosses (forty-six with pensions), two hundred and twentytwo Grand Officers (one hundred and twenty-five with pensions), one thousand and thirty-four Commanders (four hundred and fifty-seven with pensions), four thousand seven hundred and fourteen Officers (one thousand four hundred and fifty with pensions), and forty-eight thousand and eighty-five Knights (sixteen thousand eight hundred and thirty-one witb pensions).